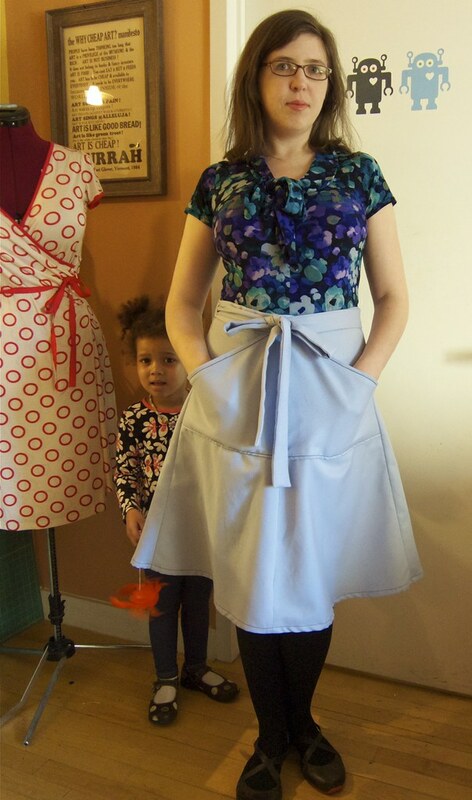 I had been wanting to make Tilly's Miette wrap skirt for ages, and it seemed like a perfect vacation project—minimal fitting, no zippers, no darts, just fabric. 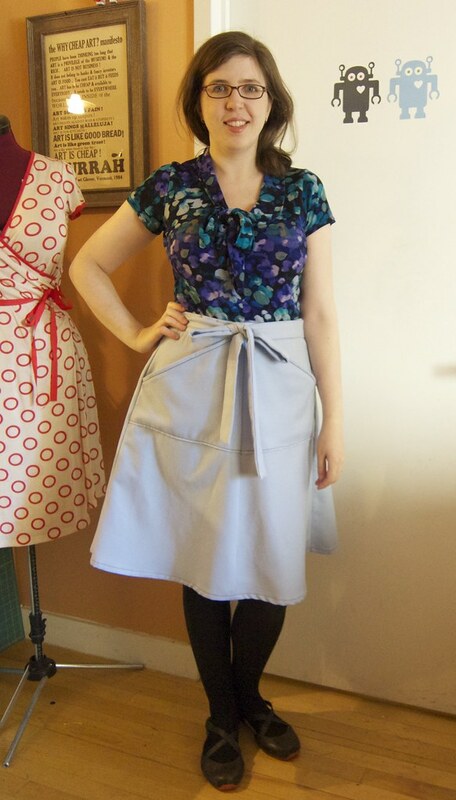 And I really needed some solid color skirts to balance all my loud printed tops. Susan is NOT a solid fabric kind of person (she is a woman of stripes and bold patterns after my own heart) but she did manage to extract a few plain unsewn twills from her stash, and I chose a pale blue rayon/cotton blend one because it had the best drape and feel. It was challenging fun to use an unfamiliar machine, use the floor for a cutting surface, and give up my perfectionist tendencies to get the project done quickly so it wouldn't interfere with any of our family vacation plans, like swimming in Barton Springs Pool or making homemade tamales. Alas, we were only in that vacation rental for a few nights, so I had to finish the hem and waist bits when I got back home yesterday—but I was still technically on vacation, so it's still my vacation skirt. AND my sewing machine seems to be working happily again, though I had to move it into my bedroom so I can use it at night without waking the little girl. Fabric: A bit less than three yards of pale blue cotton/rayon twill blend from a friend's stash. 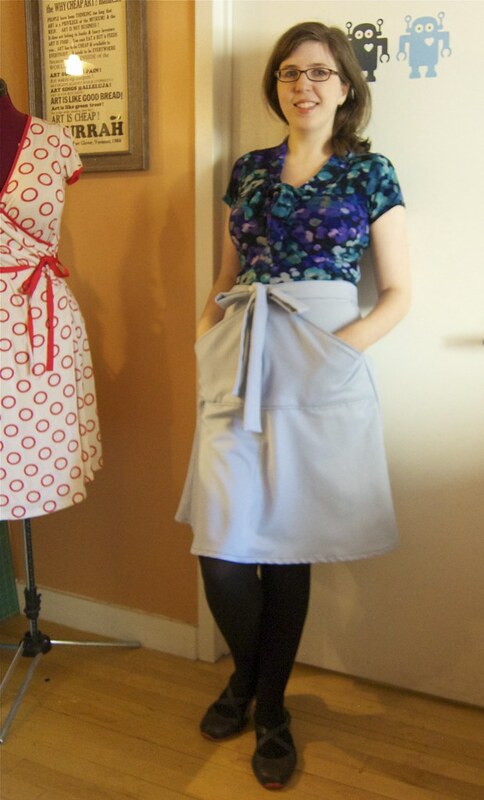 It is soft and has a lovely weight and drape, but I must admit I came to loathe it during sewing and pressing, as it was very fussy and did not cooperate with the scissors, machine or iron and frayed like a really frayable thing. All my best efforts were for naught—despite lots of hand basting and unpicking, there are still puckers all around the hem and pocket edges—is this a twill issue? It is soft and lovely to wear, however. Notions: Just some black thread and interfacing. Size: I made the size 4, sized for a 30-inch waist and 39 inch hips—both just slightly bigger than my actual measurements. I ended up taking it it in about 5 inches total at the hips but left the waist alone. Instructions: Tilly has detailed photo tutorials on her website, but I just used her excellent short-form written instructions from the PDF. I loved that each step had a little checkbox to tick off, giving me a serene sense of accomplishment. Construction notes: I didn't do all the seam-trimming and finishing I normally would—I left most of the seam allowances their full size, and just pinked them to stop the massive fraying. Love that no-grap wrap back view! Successes: I actually sewed something I can wear for the first time since last summer. I was tempted to hedge and call it a wearable muslin, but it is wearable. Period. Beware of wobbly topstitching in a dark contrasting color. If you try ten times to tie a proper pretty waist bow and fail, ask the internet and you will find a gazillion helpful tutorials (I finally got it with this one). Will I make it again? Absolutely, though I will choose my fabric more carefully next time—maybe a light denim or other solid color bright woven will do the trick. Wear to: Work, home, weekend, mommy stuff, whatever. 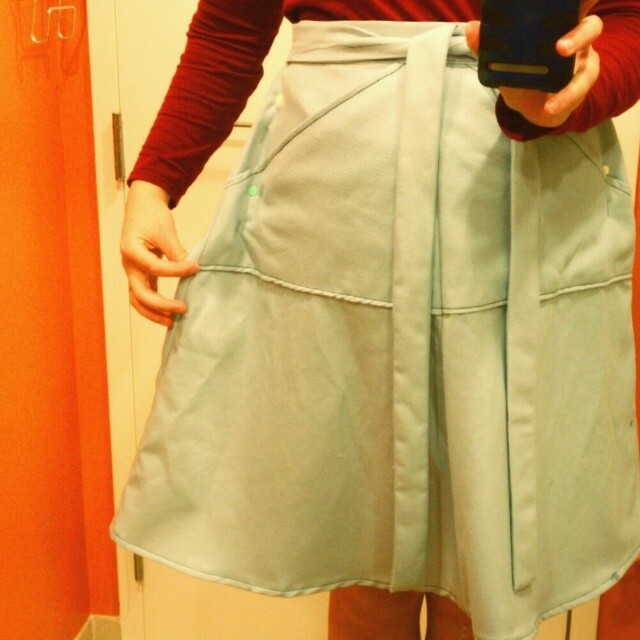 Adjustable skirts are the best (especially if you plan to make/eat lots of homemade tamales, yum). Very nice skirt!! Your daughter is so cute, too!! Yes, she is quite the photobomber... she likes to press the button on the camera self-timer and then run in giggling. Yay for breaking the ice, right?? ;) I'm glad it turned out so lovely despite the fabric troubles... And yeah, apparently I can thank you for taking THAT off my hands, sounds frustrating. 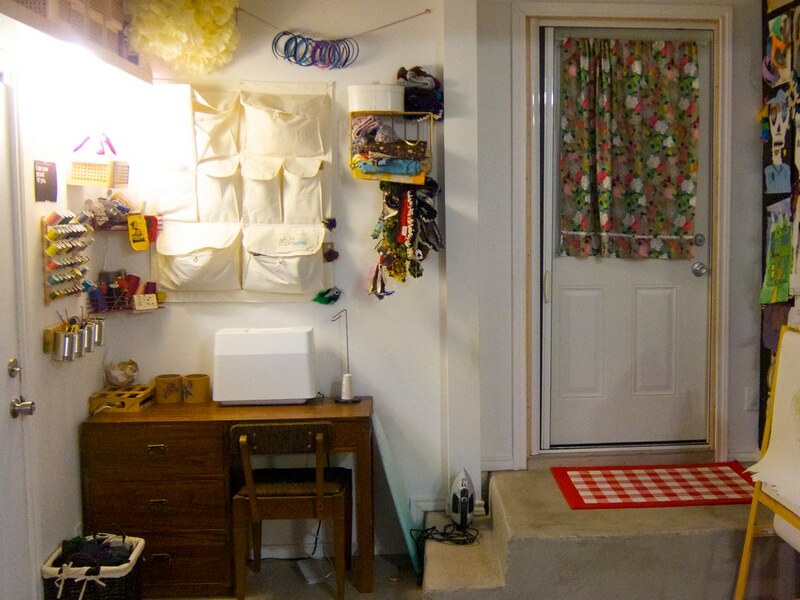 Can't wait to see what you do with your ATX fabric haul, too. :) Loved seeing your little photobomber! 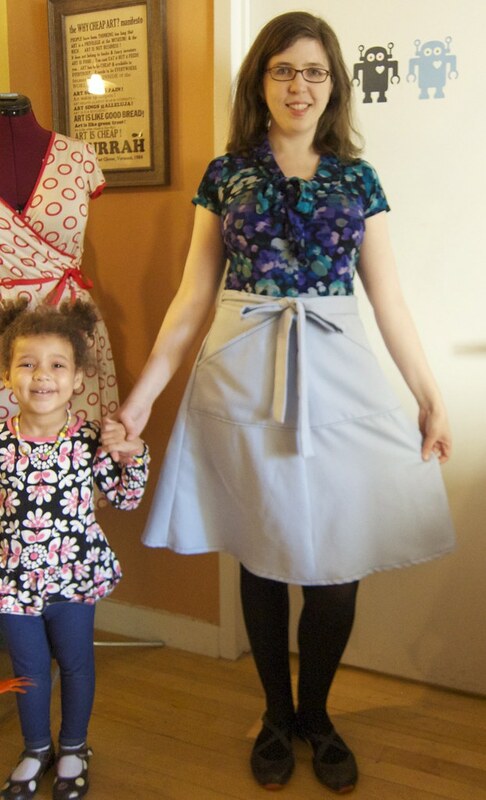 I made at least 6 of those wrap skirts in the mid-80's when I had toddlers (and weight issues) and wore them all the time I believe I used a McCall's pattern which had patch pockets, a narrower waist band and shorter ties (which I feel to be more flattering than those long ones), a full coverage back overlap but the hem ALWAYS puckered. Love your DVF wanna-be on the dummy! I wonder why the hem puckers on that type of skirt, then? Hmmm... Next time I may use hem tape. 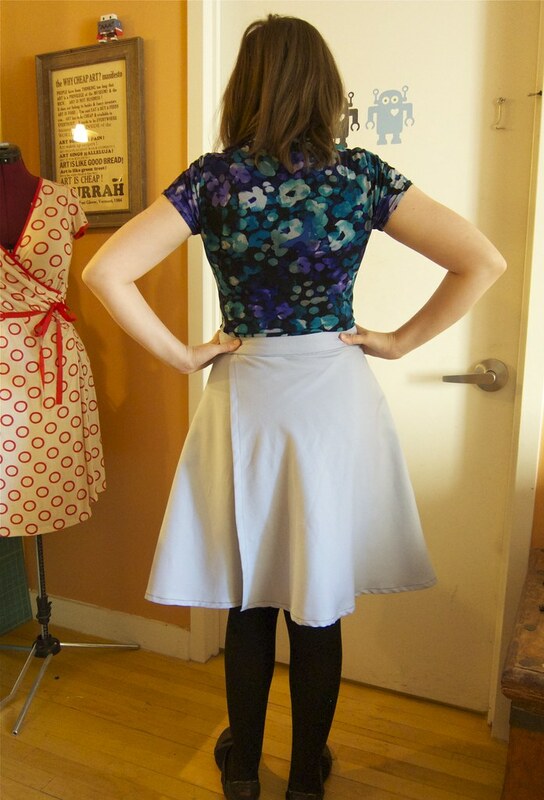 It is SUCH a practical style for changing weight (I do love knit skirts, but need to mix it up sometimes). I wish I could take credit for that dress on the dummy--it's just a RTW dress I picked up ages ago, but I keep meaning to recreate it (too small for me at the moment) and I use it to keep the dummy dressed when not in use. Aren't parts of the skirt pattern placed on the bias? That would account for the puckering -- bias tape almost always puckers someplace on a project. 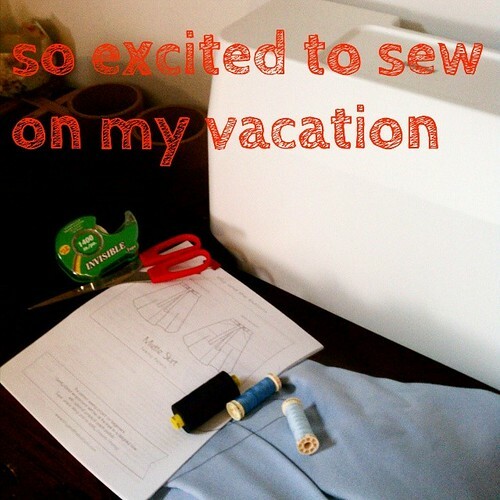 How great that you were about to take time for yourself and sew a project while on vacation. Score! It was great meeting you and your little one! It was great to meet you too! I hope your vacation was (is?) awesome as well.